Located in the charming fishing village of Porto Colom and just 500m from the Cala Marcal beach, the Bellevue Belsana hotel offers a relaxing atmosphere with an all-inclusive scheme. Enjoy beautiful views of the sea from the hotel’s outdoor pool while taking a refreshing swim, or enjoy the wonderful cuisine from the hotel’s buffet restaurant, and relax with a drink at the lounge bar. There is also a wide range of sports and leisure activities around the hotel’s vicinity, such as bike rentals, golf course, night clubs, water sports, and hiking. The Bellevue Belsana offers 70 comfortable rooms, all equipped with a terrace or balcony, air conditioning, private bathroom with bathtub and shower, and satellite TV. The friendly service and the complicity of professionals will ensure that your vacation will always be satisfying. 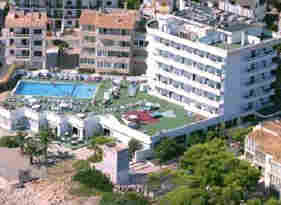 The Bellevue Belsana is approximately 48km from Son Sant Joan International Airport and 66km from Palma de Mallorca.